AP Series - TFT’s Jumbo Small Ball Intake Valve has a huge 5-¼ inch diameter waterway giving low friction loss to maximize fl ow. Friction loss is 3 psi at 2000 gpm. Designed for use with 3.5, 4, 4.5, 5 or 6 inch (89, 100, 115, 125, or 150 mm) hose. Designed for pressure or vacuum service on a pumper. Maximum operating pressure is 250 psi (17 bar). Meets 900 psi (62 bar) hydrostatic strength test. The aluminum castings are hardcoat anodized, and TFT-powder coat fi nished inside and out for maximum corrosion protection. All the components on the wet side of the valve are made of stainless steel for additional corrosion protection. The handcrank needs 7-½ turns to close, meeting NFPA slow close requirements. There is a unique position indicator that shows the operator if the valve is open, closed or somewhere in between. The handcrank is installed with a 2-5/8” swing but may be switched to 1-5/8” if desired. 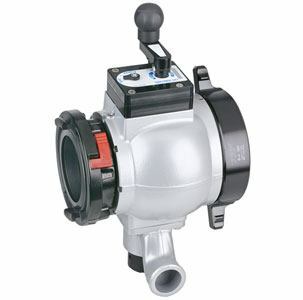 The unit comes equipped with a rugged 3/4-inch (19mm) drain valve to quickly drain water from the valve housing. A port for an optional air bleed valve is incorporated into the design for user friendly configurability. Hose coupling and truck connections are attached to the valve using polymer bearing rings which provide electrical isolation to help prevent galvanic corrosion. Includes TFT’s adjustable pressure relief valve with a discharge that can be directed one of four ways and meets NFPA 1901. Contact TFT customer service for configurations not shown. Cap lanyard anchor point is standard. Storz models available with rigid of full time swivel. Also available with rocker lug or long handle NH inlets and outlets.